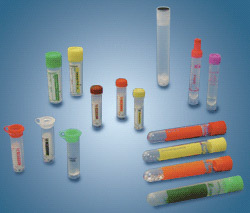 Prepared Tubes | Tamar Laboratory Supplies LTD.
A wide range of screw cap and push cap prepared blood tubes made from PP and PS are available for use in “open” system blood collection. Prepared micro tubes with attached PE push caps or screw caps are also available for a range of applications. Nominal volumes for these containers are 1.3 ml, except for coagulation which is 1.0 ml.